Pushing a loaded, wonky, trolley around a supermarket is already hard work - but soon it could be a real workout. The 'Trim Trolley' has been designed to have attachments that would normally be found on a machine in the gym. It shows a shopper's heart rate through sensors on the bar used for pushing the trolley, and how many calories are being burned while they shop. The makers say it might make people decide to reach for some fruit, rather than the chocolate cake. The trolley, designed by German company Wanzl, even allows shoppers to make their shopping workout harder by increasing the resistance on a large wheel between the two rear wheels on the trolley. Shoppers are thought to burn up around 160 calories during a typical 40-minute visit to the supermarket pushing a standard trolley. But pushing the Trim Trolley for the same time, with the resistance level set at seven out of a possible 10, the average person would burn up around 280 calories, the equivalent of a 20-minute leisurely swim. 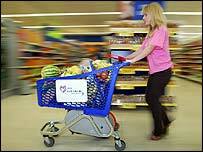 A prototype of the £500 trolley is due to be introduced at Tesco in Kensington, west London, next week. Standard trolleys cost around £70. Tesco has yet to decide what security measures it will introduce to ensure it remains in store. A spokeswoman for the company said: "It is a response to customers' growing concerns about health and fitness. "At the moment it is just a prototype and it is hard to say how many stores they could eventually be in." But she admitted using the trolley would not ensure people would choose healthy foods. Wanzl, which supplies Tesco with between 80,000 and 100,000 standard trolleys a year, has spent the past few months developing the Trim Trolley. Spokesman Derek Thowney said: "It is the first time we have designed a trolley like this and there is nothing else like it in the world. "It is a standard trolley but with the sort of fitness attachments you would find in a gym, enabling you do a workout while you shop." The trolley was launched to mark Tesco's sponsorship of Race for Life, run in aid of Cancer Research UK.